Aerial dragon battles. A girl with a cool mystical powers. Cute boys on motorbikes. What more could you ask for in a fun and fluffy paranormal book? Flying Blind took me completely by surprise. The story follows Zoë Sorensson, the only female dragon shapeshifter in existence, who has important duties to assume when she comes to maturity. The problem is, her powers haven’t bloomed properly and the few times they begin to appear–in the form of a mesmerizing flame in the pupils of her eyes and a single curved talon–she can’t control them. As a result, she’s shipped off to dragon “boot camp” where she’s huddled with a group of dragon boys she’s known all her life, including Nick, the attractive guy who she may be destined to be with. The dragon lore is exceptionally well thought-out, with specific behaviors and mythology. I enjoyed the vivid descriptions of the different dragons, from a green one with silver-tipped scales to a beautiful garnet and gold one to a regal pewter and purple one with silver accents. The dragon battles are also very easy to picture, with muscular physical tussling, claw-slashing, orange-flamed fire-breathing, and tail-whomping–and with none of the typical fast-healing, “easy fix” powers to lessen the stakes. Zoë is a bright, funny heroine who narrates with a breezy tone that’s immensely appealing. She’s trying to gain control of her body while trying to figure out why such a dark cloud seems to hang over her normally good-natured friends, and there’s a lot that’s thrown at her as she’s coming into her role as a member of the Pyr. She makes a lot of mistakes, but she owns up to them and is never afraid to take action when it matters most. I like that all of the huge cast of secondary characters have a distinct voice and identity, and that things don’t always go the way that seasoned YA readers might expect with mysterious strangers or popular girls. The story is fairly complex for a short book, but it’s very light-hearted in tone, which is a refreshing change from all those supernatural YA books that aren’t well-thought out or that take themselves too seriously. One of the many humorous touches? Zoë, kickass girl dragon, is a vegetarian. This book is apparently a spinoff of the author’s adult PNR series, but it doesn’t feel like something that’s hastily cobbled together or that is at all lacking in explanation. The author does a terrific job of gradually revealing the rules and history of dragon behavior, as well as in giving enough time (but not too much time) to characters from the other series in a way that doesn’t feel tiresome or forced. It’s also great to see a book that shows teens with strong, warm relationships with the adults in their lives–but the crises are deftly handled and solved by the younger dragons themselves. I will say there’s a lot of information to process, and Zoë does occasionally get a little moony over her crush. But all the romance issues are resolved by the end of the book, and there is plenty of time spent on the family and friend relationships, mythology, plot, and personal development to balance the relationship stuff out. 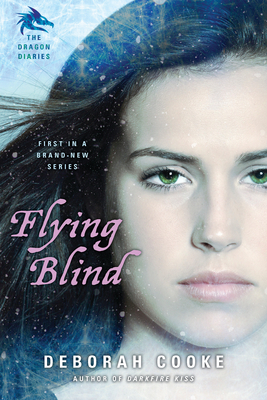 I’d highly recommend Flying Blind to any fan of non-angsty paranormal/fantasy YA, especially to fans of series such as Hex Hall or The Darkest Powers. Zoë does a lot growing up in this zippy, action-packed story–and after having such a fun whirlwind of an adventure with her, I can’t to see where the next story takes her! Bookish 2012 Films & Blogoversary Winners! Hello! thank you so much for stopping by ^_^ love meeting new bloggers ^.^ muah! Thanks everyone–it’s such a fun and fluffy book, and it put me in a really good mood after I read it. :) Hope you get a chance to read it soon! And yes, Flannery–I’d never heard of this author before, but I’m definitely checking out her adult dragon books at some point. This sounds good! I’m assuming you don’t have to read the adult series to appreciate this series? I’m like that fun and fluffy paranormal seems to be growing. I’m hoping it’s going to overthrow the rest of the genre. Would be a nice coup. This sounds awesome!! I’m adding it. I’d never even heard a mention of this book until you told me about it. I am really interested to try it because I read a YA dragon series a while back (Jennifer Scales series by MaryJanice Davidson and her husband(I think)). I liked that but it felt a bit too juvenile to be truly enjoyable. I’ve never heard of this author before. Are you going to read her adult stuff now? this sounds so good! i’d never seen it before, so thanks for putting it on my radar! Oh it’s really nice to have a book about dragons ! I didn’t know this one but your review makes me want to read it now, thanks !